Everytime I go outside, I have to be conscience of my number one enemy… the Mosquito!! Yes, here in Texas there is nothing more menacing than that tiny little insect. So as a result I am constantly trying different products to combat the nuisance. 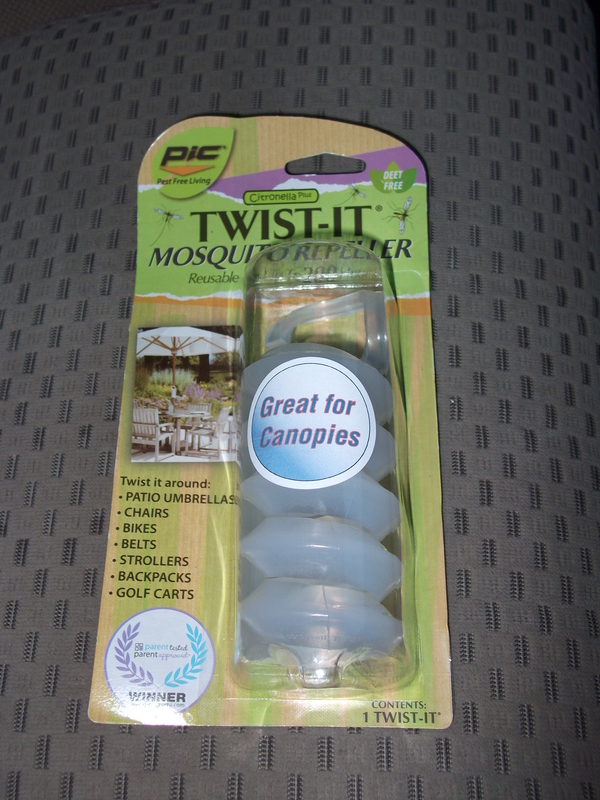 Last time my husband and I went to the beach for some camping and crabbing, I picked up a new product that designed to repel mosquitos. This particular product is made to twist around objects and provide a barrier of protection. 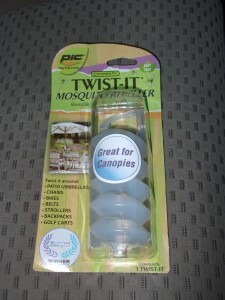 The ability to hang or twist the product on chairs and canopies is great. I used it on my camping chair and for the most part it stayed put. It claims it is reusable for up to 200 hours. I haven’t used it for that long yet, but it does come with a ziplock type baggy to store it in after you have opened the original packaging. I like this, because now I can reuse it at a later point. I simply stored it with my camping gear and it’s ready to use. As far as it’s ability to repel mosquitos, I can honestly say that we didn’t have too many hanging around while the Twist It was in use. The minute I walked away from the Twist It towards the truck, I was covered in thousands of blood sucking mosquitos. So from what I can tell, the Twist It seems to work. It’s Deet Free, which is nice because I’m not a big fan of deet constantly being applied to me. I know it’s necessary sometimes, but there are times that I like to give the deet a rest. We bought this product at Academy Sports and Outdoors for pretty decent price. Since it’s reusable, I think we got our money’s worth. Overall, I’m fairly happy with this product!! 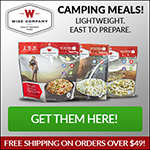 If you want to try it out for yourself, get it at amazon. This entry was posted in Gear Reviews, Uncategorized. Bookmark the permalink.